The best way to get the feel of a country a little bit better is to physically travel it. How a country feels – the people in the place – in it’s capital, or a major city, compared to the farmlands, the mountains, the sea-ports or wherever, can give you a markedly different impression of the country, for better or worse. See any many aspects as you can really increases your appreciation for it. On a small scale, that’s pot-luck ordering in restaurants. I used to walk into Ramen shops and order whatever the person next to me was having by pointing at it, as even when I could read the menu, I still didn’t always understand what it was. I never got overcharged. In fact, sometimes, I’m sure they undercharged me for even doing this. We go up the scale, and travel by rail; Japan is a gift for doing this because the rail systems are simply amazing, and it’s a pleasant way to travel, either bimbling long in local trains, hitting the Shinkansen for that faster feeling, or taking your time on one of the long scenic runs like the Cassiopeia. Some visitors and foreign residents to Japan hire or buy a car and see more of the country that way – and it is a great way – though the traffic jams are sometimes not so fun, and you very quickly understand the fetish for in car entertainment. Sorting that license out, or using an International if that’s legal for you does put some people off. Somewhere in all that though, there is the motorbike, and I wonder if some people overlook it. 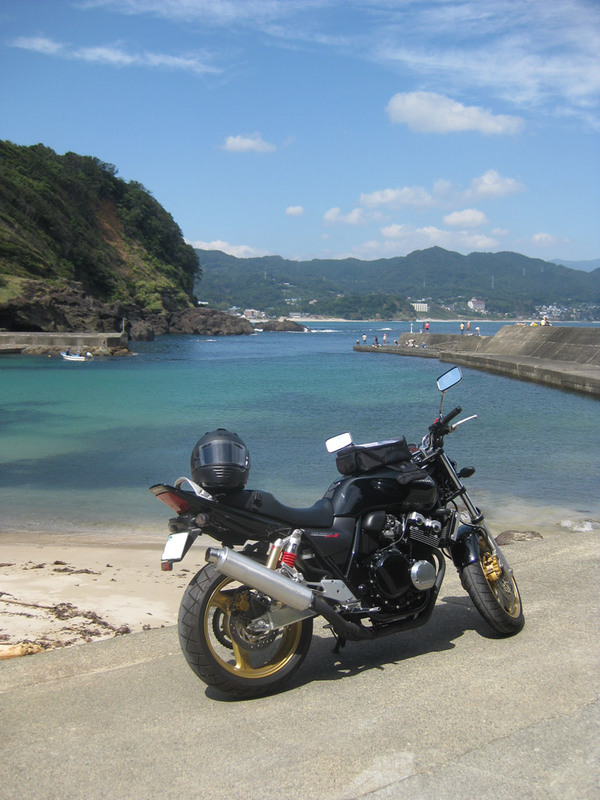 Frankly, that’s a mistake – if you truly want to know a country – get on a motorbike. I should say now that this isn’t a tutorial on getting a license and all that – better people than I have already invented that wheel, so pop on over to GaijinRiders, or SBKJapan, and the enthusiasts there will help you out, and the ‘Motorbiking in Japan‘ blog, if only because he chronicles going from not being a biker, to loving his bike. In a more humble context, new family life restricts my riding and where I now live, I can’t commute by motorbike, but I do love to get out for days, or even just half days and run out on the bike. I’ve written on here a couple of times about some of the places I’ve been, and seen, but perhaps what I haven’t mentioned is that I couldn’t have done any of it without the bike. 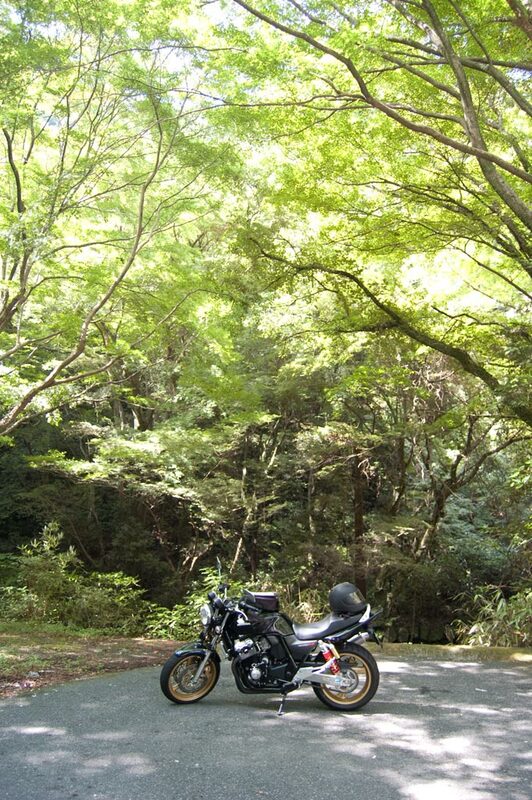 Some of the weird roads I’ve travelled, some of the very odd tunnels, tea houses I’ve stopped at, accidental off road excursions and so on, none of it would have been possible without the bike. Really, some of these places either aren’t signposted, or aren’t on a map, or you wouldn’t think to take a car down. On a bike, you just turn, when you want to stop, you just stop – parking isn’t much of an issue, and even the rain doesn’t stop the fun. It’s not just the riding and the environment though, it’s the reaction of people, the more obscure the place you go, the more interesting riding there becomes. In early January this year, I took a freezing run down the coast road here in Kanagawa; that’s the literal meaning of ‘freezing’ too. I stopped off for some coffee and got into a great conversation with the few other bikers there, as to how completely mad we were, or how truly inspired – we decided on the former. Plodding along at 80Km/h with a cold wind, looking at the beautiful Pacific Ocean, with Mt. Fuji in the clear distance is fantastic, and the frosting of ice on your helmet, and that steady chill on your hands fades away. A bit. Actually, on that trip I remember stopping at a McDonalds at the side of the road for another hot drink, and even the staff asked if I was OK on the bike. I took the coffee outside, walked through a passageway under the coast road, and spent the time it took me to drink the coffee talking to some people fishing off the quayside. Does this happen if you’re in a car, or does having biker leathers on key into something which means you’re safe, because you’re out there? My Japanese isn’t great, but I’m fairly outgoing – I’ll talk about anything, so for me , being on the bike has been great to just meet people doing their thing. 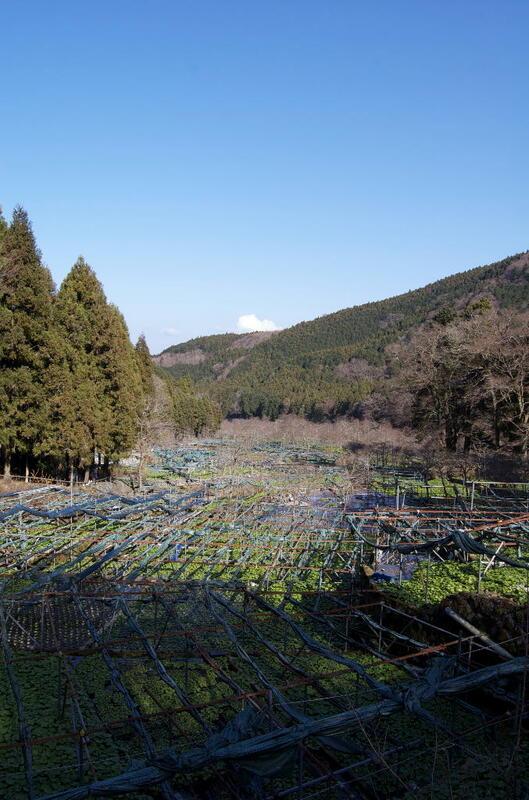 On a different tack, a friend and I were just picking random turns in Izu, and ended up in a valley, where the river seemed to be full of vegetables, with a little rail track in the air with a cart. From a few signs we’d seen on the way for shops, we assumed this was a wasabi ‘field’. It was completely fascinating – I’d heard they prospered in running water, but I’d never seen it, and since the whole area was serviced by the traditional farmer’s vehicles – tiny white Suzuki vans, I suspect many others haven’t either, apart from the more tourist ones, unless you were on a bike. Meeting up with fellow bikers, just by accident is always interesting – the bike itself is a topic of conversation. I remember talking to a man in his late sixties at a service station, who pulled up on an old Harley Davidson, with his wife on the back. We were just talking about bikes, and I asked him whether he’d thought about getting a Prius as I see a lot of retired people driving them. His response was a hysterical mime of the kicking of cars and the throttling of owners: “Prius drivers are idiots!!”. You see all these old men, maybe former senior businessmen or something when they worked, and imagining them in a Prius, blocking traffic somewhere, and you realise that the cool, interesting ones spurned that, and keep to two wheels, and are enormous fun to be around. Anyway, I think you get the idea – I love biking. Not for speed or to talk specs or anything like that, just because I like being out there, plodding along, feeling the environment around me, and hoping I remembered to put my rain gear back under the seat.